Here are the official details and press photos of the 2010 Chevy Camaro, which has become a bit of an afterthought given the giant friday leak and the Camaro live blog. Below the jump is a full gallery of the official (leaked and un-leaked) shots of the new Camaro, as well as full details on the car GM is calling a "Fun, Efficient Car For The 21st Century... That Looks Mysteriously Like A Car We Built Forty Years Ago In The 20th Century." Hit the jump for more photos and the press release. • such as highway cruising, to improve fuel economy. • which provides easier and safer calling and dialing. DETROIT -Chevrolet introduced the production 2010 Camaro today. It is a heritage-inspired sports car for the 21 st century, combining great looks and performance; advanced technology and surprising efficiency - including 26-mpg estimated highway fuel economy. Sales begin in the first quarter of 2009. Built on GM's new, global rear-wheel-drive architecture, the Camaro is offered in V-6-powered LS and LT models, as well as the V-8-powered SS. All models and powertrain combinations include fuel-saving six-speed transmissions. "Camaro delivers all of the things that make Chevrolet such a revered, global brand," said Ed Peper, GM North America vice president, Chevrolet. "It competes with the world's best sports cars and does so with styling, fuel economy and value our competitors simply can't match." "The new Chevrolet Camaro delivers a thoroughly modern, advanced package of performance, comfort and technology," said Peper. "It's a sports car for a new generation of enthusiasts that doesn't forget the heritage that helped make the original a cultural icon . That is no small feat and it took a worldwide commitment to achieve it." Indeed, the 2010 Camaro exemplifies GM's global development process. The design concept originated in the United States; engineering was directed by GM's global rear-wheel-drive team in Australia; validation was conducted on roads around the world and assembly will take place at GM's award-winning Oshawa facility in Canada. to help the driver maintain control during certain maneuvers. • The system provides increased vehicle control by continuously monitoring the car's steering angle, individual wheel speed, brake pressure, lateral acceleration and yaw rate. driver keep the vehicle on path. With a design that is very faithful to the original concept, the 2010 Camaro is a 21 st century sports car that acknowledges its heritage. A long front dash-to-axle and short rear deck give the Camaro classic proportions, while a sleek windshield profile, wheels pushed to the corners and muscular fender forms are modern elements that reinforce its advanced engineering - and give the car a decidedly aggressive stance. Elements such as a forward-V shape at the front of the car and "gills" in the rear quarter panels are distinctly Camaro cues, as are the broad rear fender "shoulders." Those elements make the new Camaro instantly recognizable, but their execution is smoothly integrated into the contemporary exterior form. A family of large, 18-, 19- and 20-inch wheels also contributes to the Camaro's modern appearance. 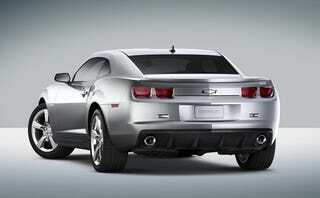 "The new Camaro is just that - new," said Ed Welburn, vice president of GM Global Design. "We acknowledge the nameplate's strong heritage in the design, but recognize that keeping this modern sports car relevant meant more than simply honoring a classic car. The line forms, stance and overall execution are consistent with other new Chevrolets." A well-executed balance of heritage, modern design and attention to detail also characterizes the Camaro's interior. A pair of deeply recessed instrument binnacles that feature round gauges in square housings is a nod to classic Camaros, while an available ambient light package offers advanced LED light pipe technology to give the cabin a distinctive and inviting glow. Cloth upholstery is standard; heated leather-appointed seats are available. Details such as large, chrome-trimmed controls, low-gloss surfaces and premium fabric or acrylic appliqués convey a richness that is unprecedented in previous Camaro models - and challenge its contemporary competitors. More great detail is evidenced in the available center-console gauge cluster, which takes its cue from a similar option on 1969 Camaros. It displays oil temperature, oil pressure, state-of-battery and transmission fluid temperature, all highlighted with modern LED backlighting. An advanced, efficient 3.6L direct-injected V-6 with variable valve timing is standard on LS and LT models. Direct injection technology helps the engine deliver more power through increased efficiency, while maintaining fuel economy and lowering emissions. That means less fuel is consumed and lower emissions generated - including a 25-percent drop in cold-start hydrocarbon emissions. The Camaro's 3.6L engine also employs variable valve timing to optimize performance and fuel economy across the rpm range. It is rated at an estimated 300 horsepower (224 kW) and 273 lb.-ft. of torque (370 Nm). A six-speed manual transmission is standard with the 3.6L engine; a Hydra-Matic 6L50 electronically controlled six-speed automatic, with TAPshift control, is available. The high-performance Camaro SS is equipped with a powerful 6.2L V-8, with a choice of a six-speed manual or six-speed automatic transmission. Standard, manual transmission-equipped models receive the LS3 engine, estimated at 422 horsepower (315 kW) and 408 lb.-ft. of torque (553 Nm). The LS3 debuted on the 2008 Corvette and uses high-flow cylinder heads based on the Corvette Z06's LS7 engine to enable great low-end torque and high-rpm power. It is paired with a TR6060 six-speed transmission. A new, L99 V-8 engine is used on automatic transmission-equipped SS models. It is based on the LS3 and carries all of its high-performance design features, but also includes GM's fuel-saving Active Fuel Management feature. It enables the engine to run on only four cylinders during light-load driving conditions, such as highway cruising, to improve fuel economy. The V-8 is estimated at 400 horsepower (299 kW) and 395 lb.-ft. of torque (535 Nm); and it is matched with a Hydra-Matic 6L80 six-speed transmission. This combination delivers an estimated 23 mpg on the highway. The 2010 Camaro is built on GM's global rear-wheel-drive architecture, with a strong body structure that enhances safety, quietness and handling. World-class build quality and attention to detail are enabled by features including one-piece body side stampings and very precise tolerances between body panels. GM's StabilTrak electronic stability control system is standard and incorporates traction control. The system on SS models includes Competitive/Sport mode that is adjustable for performance driving, such as on a racetrack; it also includes a Launch Control feature on SS models with the manual transmission. It enables quicker, more consistent takeoffs during performance driving. Designed to protect occupants before, during and after a crash, the Camaro offers a comprehensive system of safety features - starting with a robust body structure and integral safety cage around the passenger compartment. High-strength steel and ultra high-strength steel are used in key areas throughout the structure. the front passenger airbag will not deploy. senses children and small-stature adults and suppresses air bag deployment when appropriate. Standard OnStar service assists after a crash. With OnStar's Advanced Crash Response System, the vehicle automatically sends a signal to OnStar for assistance, even if the air bags don't deploy.